Angela Penick attended high school in the Cincinnati area, and subsequently obtained a Bachelor's of Science from the E.W. Scripps School of Journalism at Ohio University. 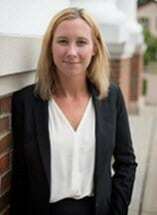 After working as a writer, Ms. Penick returned to school to obtain her Juris Doctorate from Northern Kentucky University's Chase College of Law. Ms. Penick joined Kroener & Hale after working for a family law firm that focused on representing the interests of men and fathers in domestic disputes. Ms. Penick's entire career has focused predominantly on family law issues and representing clients in divorce, custody, visitation, and domestic violence cases. Ms. Penick is admitted to practice law in the State of Ohio, as well as Federal Courts in the Southern District of Ohio. Ms. Penick is proud to be a member of the Executive Board for the Village Life Outreach Project, a Cincinnati-based non-profit group that works toward uniting communities to promote Life, Health and Education in impoverished villages of rural Tanzania, East Africa. You can learn more about this organization at villagelifeoutreachproject.org.